Washington D.C. (December 4, 2014) – Today, IAVA veteran members delivered a petition to Majority Leader Harry Reid (D-Nev.) calling on him to bring the Clay Hunt Suicide Prevention Bill to the Senate floor before Congress adjourns next week. The hand-delivered petition includes signatures of more than 59,000 IAVA veterans and family members urging Congress to help reverse the trend of 22 veterans dying by suicide every day. The bill, introduced in November by Senator John McCain (R-Ariz.) and co-sponsored by Richard Blumenthal (D-Conn.), Richard Burr (R-N.C.), Roy Blunt (R-Mo. ), Lisa Murkowski (R-Ala.), Joe Manchin (D-W.Va.), Mark Begich (D-Ark. ), Richard Durbin (D-Ill.), Dean Heller (R-Nev.), Mike Johanns (R-Neb.) and Jerry Moran (R-Kan.), will help combat veteran suicide and improve access to quality mental health care. 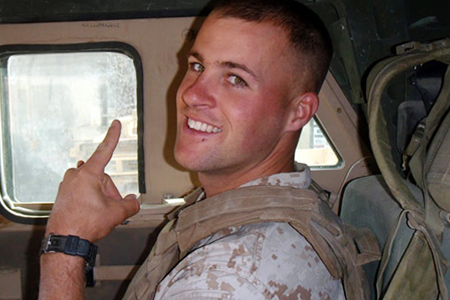 The bill is named after Iraq and Afghanistan war veteran Clay Hunt, a Marine who died by suicide in 2011. “As a veteran who has had good friends die due to suicide and having had thoughts of my own that lead towards it, it is extremely important not to sweep these things under the rug, but to address the problems.” – North Las Vegas, Nev.
“A veteran can feel very alone. Been there. I want to be there for my brothers and sisters.” – Las Vegas, Nev.
“As a disabled veteran who has personally struggled with depression and at times thought of committing suicide, I want all veterans to know there are people who care about them.” – Las Vegas, Nev.
“Have dealt with three suicides at my base within last 12 months … do not want any more lives lost.” – Nellis AFB, Nev.
“Every year I lose another brother.” – Sparks, Nev. In July, House Veterans Affairs Committee Chairman Jeff Miller (R-Fla.) and Reps. Tim Walz (D-Minn.) and Tammy Duckworth (D-Ill.) introduced the House version of the Clay Hunt Suicide Prevention For American Veterans Act (H.R. 5059). The legislation, spearheaded by IAVA, is named after Iraq and Afghanistan war veteran Clay Hunt, a Marine who died by suicide in 2011. On Nov. 19, Clay’s mother Susan Selke testified before the Senate Veterans Affairs Committee that her son’s appeal for 100 percent disability for post-traumatic stress disorder was approved five weeks after he died. And in late August, President Obama announced executive action on mental health for veterans and active-duty servicemembers. The executive action was created in consultation with IAVA and included new initiatives on raising awareness for suicide prevention, mental health research, pilot programs on peer support and more. Also attending IAVA’s press event was Bonnie Carroll, President and Founder of Tragedy Assistance Program for Survivors (TAPS).